CORONA, Calif. (August 14, 2018) — Yuneec International, the world leader in electric aviation, today announced its all-new Mantis Q, the latest extension of Yuneec’s award winning consumer lineup, is now available for pre-order in the United States. Mantis Q is an adventure ready drone controlled via mobile device or remote, features voice control technology and is small enough to tuck away inside a bag. The Mantis Q also features foldable arms for optimal portability and convenience, up to 33 minutes of battery life and autonomous flight modes with top speeds over 44 miles per hour. Due to its portability, ease-of-use and superior flight time, the Mantis Q is ideal for adventurers, families and drone enthusiasts. Now available for pre-order on Yuneec.com, the Mantis Q starts at a suggested retail price of $499.99. With the all new Voice Control feature, users can command Mantis Q just by using their voice. Voice control allows users to take a photo or begin recording video all without having to manually take their hands off of the controls, making it that much easier to capture the perfect shot. Mantis Q responds to commands such as “Wake up” for powering on, “Take a picture”, “Record a video” and “Take a selfie”. It will also respond to the flight commands such as “Take off” to automatically start flying and then come up to a hover or auto-landing commands such as “Return home”. Other notable features of the Mantis Q include its facial detection and gesture control. Users simply smile at the drone to activate face detection and as soon as the Mantis Q “sees” the user’s face, it will take a photo from up to 13 feet away. In Gesture Control mode, Mantis Q will detect a hand waving and it will take a photo. Using an integrated camera, the Mantis Q records high resolution photos and videos. Pictures with a resolution of 4800×2700 (16:9) or 4160×3120 (4:3) pixels are saved in JPEG or DNG format on the included MicroSD card; the same goes for up to 4K of recorded videos. In up to Full HD (1920×1080), they are electronically stabilized live. The camera can be tilted upwards by up to 20 degrees or downwards by 90 degrees during flight. For cinematic camera flights, the Mantis Q also comes with automatic flight modes such as Journey, Point of Interest and Orbit Me. Thanks to its energy-efficient design, the drone can stay in the air for up to 33 minutes, allowing pilots plenty of time to record great photos and video clips. When folded together, the Mantis Q measures just 6.6 x 3.8 x 2.2 inches and weighs just 1 pound. It’s the ideal companion for big and small adventures alike. Unlike most in its class, Mantis Q comes equipped with advanced indoor stabilization technology. Down-facing dual sonar sensors and infrared detection make it safe enough to fly indoors and outdoors. Users also have the option to fly Mantis Q with and without the added controller. If users want to experience the thrill of drone racing, they can switch to the Mantis Q’s Sport Mode. The Mantis Q can fly up to a maximum speed of 44 miles per hour – and that’s all while performing with the agility of a real racer. The live image can be viewed with a latency of less than (200ms) on a smartphone which is connected to the remote control. The Mantis Q is available now for pre-order at Yuneec.com. Mantis Q – $499.99: Mantis Q, controller, one battery, spare propellers (one set) three-port charger, power and USB cable. Mantis Q (X-Pack) – $649.99: Mantis Q, controller, three batteries, travel shoulder bag, spare propellers (one set), three-port charger, power and USB cable. Available later this year. For more information about Yuneec visit Yuneec.com. Also visit us and join the conversation on Facebook, Instagram and Twitter. CORONA, Calif. (June 12, 2018) — Yuneec International, the world leader in electric aviation, today announced its award-winning Typhoon H Plus with Intel® RealSense™ will be available to consumers at Best Buy and Yuneec.com. 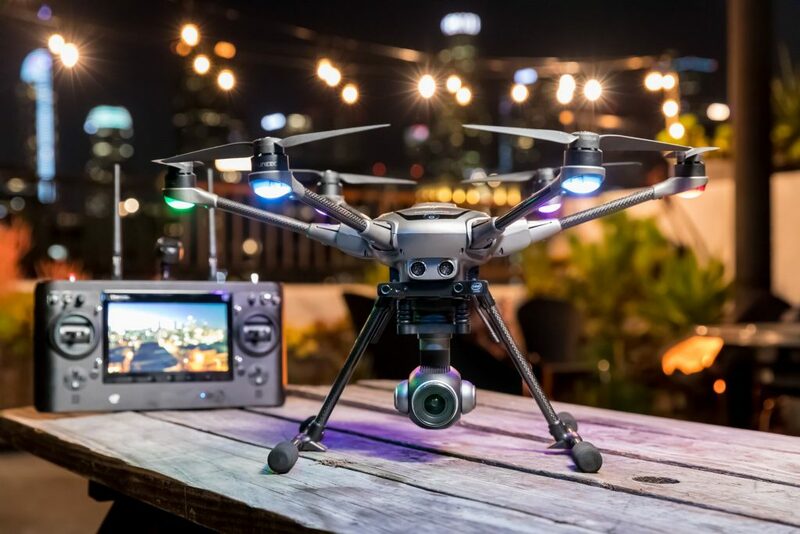 Yuneec’s most powerful consumer product, equipped with a professional grade one-inch sensor, an all-new hex airframe and intelligent obstacle navigation is optimized for photographers, creative professionals and small drone service providers. The Typhoon H Plus with Intel® RealSense™ is packed with professional image quality that photographers at any skill level will enjoy, including a high aperture one-inch sensor camera capable of 20 megapixel stills and 4K resolution video at 60 frames per second. The new model also boasts an improved low-light performance, thanks to larger aperture optics and extended ISO range, and comes standard with a continuous rotation gimbal combined with retractable landing gear that provides seamless 360-degree unobstructed views. The Typhoon H Plus with Intel® RealSense™ also has a variety of flight and image capturing modes, including Point of Interest, Orbit Me, Curve Cable Cam, Journey Mode, and Team Mode for film and photography teams. 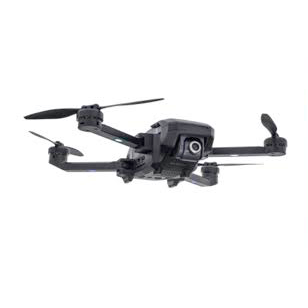 The Typhoon H Plus with Intel® RealSense™ features Yuneec’s all-new, larger, highly stable six rotor hex airframe. With a 40 percent reduction in noise from previous hex models, and stable flight in winds up to 30mph, H Plus leads its category in safe, balanced flight and quiet operation. Along with enhanced stability, the six-rotor safety failsafe system allows Typhoon H to remain stable and land if a motor should fail. The Typhoon H Plus includes Intel® RealSense™ Technology, a sophisticated collision avoidance system that detects obstacles and intelligently navigates around them. With this feature, drone pilots can worry less about obstacles and focus more on their flight path and camera work. Other innovative safety features include ultrasonic proximity detection to assist in avoiding large obstacles, which is operational when Intel® RealSense™ Technology is inactive. Additionally, the Typhoon H Plus with Intel® RealSense™ is accompanied by a newly redesigned Android-based ST16S controller, which includes a large, high brightness seven-inch integrated display and HD 720p video downlink for stunning real-time video reception. The Typhoon H Plus with Intel® RealSense™ Technology will retail at $1899.99 and be available on July 1 at Best Buy Stores nationwide. For more information about Yuneec visit Yuneec.com Also visit us and join the conversation on Facebook, Instagram and Twitter.